Sony Online Entertainment has revealed EverQuest Next, the newest installment in the MMOG series, but it won't exactly be a sequel. Even though both EverQuest and EverQuest II might be getting a little long in the tooth, Sony Online Entertainment is still pretty devoted to the franchise. In addition to a free-to-play version of EverQuest II, both games are still receiving regular content updates and expansions. However, SOE recently let players know that a new EverQuest game is in the works, and it's apparently going to be completely different from its predecessors. SOE announced the game at last weekend's annual Fan Faire. According to SOE's president, John Smedley, EverQuest Next will be a "reimagining" of the series that will, "deliver the story lines and role in another way than clicking through NPC dialog boxes." Apparently the the MMOG is also being built from scratch when it comes to PVP gameplay. Other than these details, not much else is known about EverQuest Next. 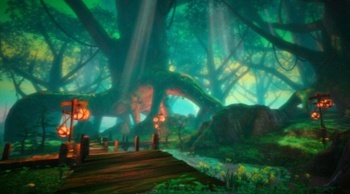 Two pieces of artwork were shown at the unveiling, showcasing a pretty different visual style from what's been present in the EverQuest games up to this point (the image here is a piece of in-game art). It will certainly be interesting to see just how different things will be in this reimagined EverQuest, but it sounds like it'll be a while before more information becomes available.